I would be very surprised if there are any readers in the world who haven't heard of Stephen King. Today's most prolific and successful writer in the horror genre, I've gotten a lot of influence from his works and applied that to my own writings. There's not a lot that can be said about Stephen King that hasn't already been said by a million people a million times. The guy is unbelievable...writing in several genres, a gazillion books, movies...majorly successful because he writes stuff that people want - and love - to read. The first Stephen King book I read was Christine, when it was first published in 1983 (I still have the paperback). Since my father and I were into restoring and selling antique and classic cars, this book was right up my alley. In fact, we actually owned a 1958 Plymouth a few years later. 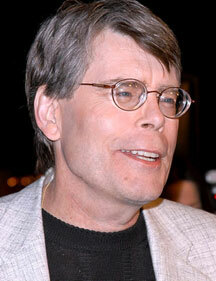 Some of my favorite Stephen King books include The Shining, From a Buick Eight, and Duma Key. What I admire most is his syle of describing things so well and so clearly that you can close your eyes and actually imagine yourself in each story's setting. Some of those images are so vivid they can stay with your for years. For more information on Stephen King visit www.StephenKing.com, or the Wikipedia page.